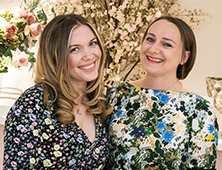 The British accessories brand was founded by best friends and ex-fashion buyers Jemma and Lesa, who met on their first day at the London College of Fashion. 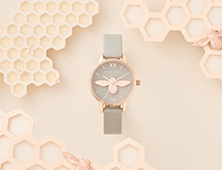 They bonded over a love of design, a passion to start their own business and a mutual struggle to find a watch that they wanted to wear. 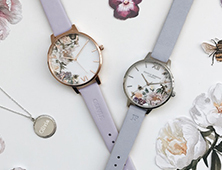 Lovers of vintage, the pair would trawl through antique markets to find timepieces, but, whilst beautiful, the cogs would often stop and start. After graduation, the girls went on to pursue successful careers in fashion buying, clocking up time at diverse fashion brands such as Topshop, ASOS and Selfridges. 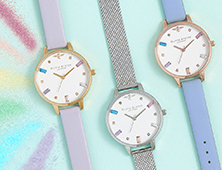 All the while, the idea of going it alone was gathering momentum until the day in 2011 when Jemma and Lesa made the leap, quit their jobs and set about creating their own beautiful, unique watches from the kitchen table. 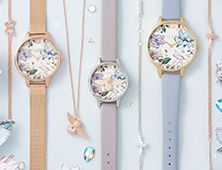 Named after Lesa’s great aunt whose spirited approach and energy was a huge inspiration to the girls, Olivia Burton debuted its first collection in September 2012. 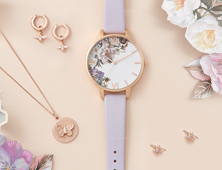 Its covetable, collectable styles, which now include a striking jewellery line-up, are inspired by vintage finds and the latest catwalk trends. Designs are brought to life at the brand’s pretty East London studio, where Jemma and Lesa work closely with their small team to ensure every piece is tweaked to perfection. 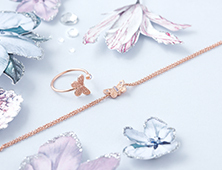 Think intricate hand-illustrations, beautiful references to nature and must-have colour palettes.